Senior representatives of the Solomon Islands Government (SIG), the Royal Solomon Islands Police (RSIPF) and the Regional Assistance Mission to Solomon Islands (RAMSI) have briefed political, church, women and youth leaders, village elders, academics and other community members in Western Province on the RAMSI exit at the end of June this year and the continued security assistance, including to the RSIPF, that will continue after RAMSI concludes. 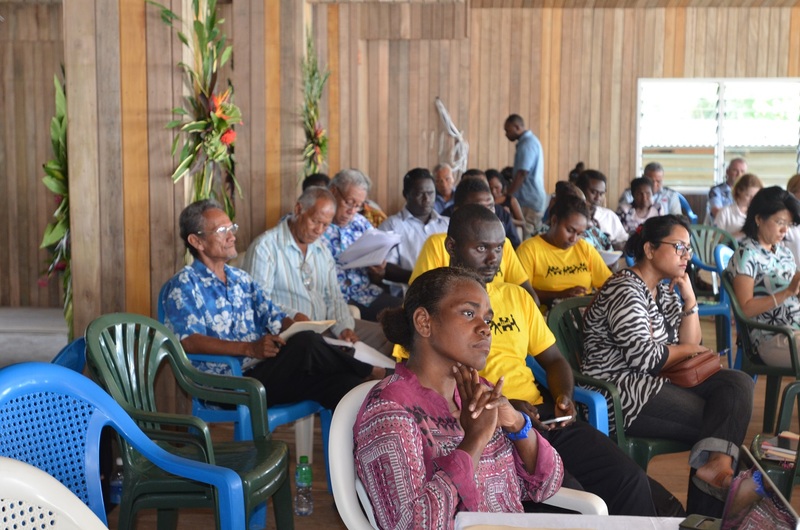 The briefing was part of the Western Province Dialogue held in Gizo 23 – 24 May. During the discussions, the SIG, RSIPF and RAMSI team emphasised that the security and future of Solomon Islands will be in the hands of its citizens when RAMSI departs on 30 June 2017. They explained that, after 14 years of assistance from RAMSI, the RSIPF is ready to take full responsibility for maintaining law and order and the security of Solomon Islands, but the police cannot do it alone. Law enforcement agencies need the support of everyone in the country. The SIG and RAMSI officials argued that Solomon Islanders must have the trust and confidence in the RSIPF. They pointed to the roll out of the Crime Prevention Strategy, the limited rearmament of the two specialist police units, and the final Firearms Amnesty (22 May to 9 June), combined with the strong leadership and good outcomes being delivered regularly by the Force. The SIG, RSIPF and RAMSI representatives told the nearly 100 delegates at the Dialogue that, while RAMSI will end, the Mission’s participating countries will not abandon Solomon Islands. Australia and New Zealand will provide, for example, bilateral policing assistance to the RSIPF from July. Solomon Islands is also finalising a treaty with Australia that would facilitate faster assistance if both nations agreed that help from Australia was required in the case of a natural disaster or other crisis. Responding to the briefing, the Premier of Western Province, Wayne Maepio acknowledged, on behalf of his provincial government and people, the enormous assistance that RAMSI had given Solomon Islands and specifically the RSIPF. “Now that RAMSI is leaving, we, the people of this country, must now take over the responsibility for maintaining law and order together with the RSIPF. This country is ours and we must take care of it,” said Premier Maepio. The Western Province Dialogue was coordinated by the Western Provincial and National Governments, with the support of the United Nations Development Program. The Dialogue’s theme of ‘Sustaining Peace and Accelerating Development in Western Province’ provided the opportunity for participants to discuss the connections between security, sustainable and environmentally friendly economic development initiatives and sustainable peace. The joint SIG-RAMSI community engagement program has covered all the provinces and is expected to conclude following visits to a number of communities in the Weathercoast of Guadalcanal before mid-June.